At the end of 2012, I wrote about mobile tools that allow us to be seriously productive while being mobile. What’s changed since then? Essentially, you can do those same tasks better and faster and you can do more than you did three years ago. The “better and faster” essentially comes down to hardware tweaks of faster processors, more memory and better screens (across tablets, smartphones and e-readers). The “more” bit is that my previous Surface RT ran a restricted version of Windows with more limited tablet-based applications (similar to the iPad but more productivity oriented) while my Surface Pro 3 runs full Windows on which all of my applications run and my phone can act like a desktop using a display dock. In this post, I’ll dive into this a bit more. My previous, 2012 set up: A Kindle Paperwhite (version 1), Microsoft Surface RT, Nokia Lumia 920 and Moleskine Large Ruled notebook. There is very little I couldn’t do with these tools in terms of research, reading, music, video and writing. 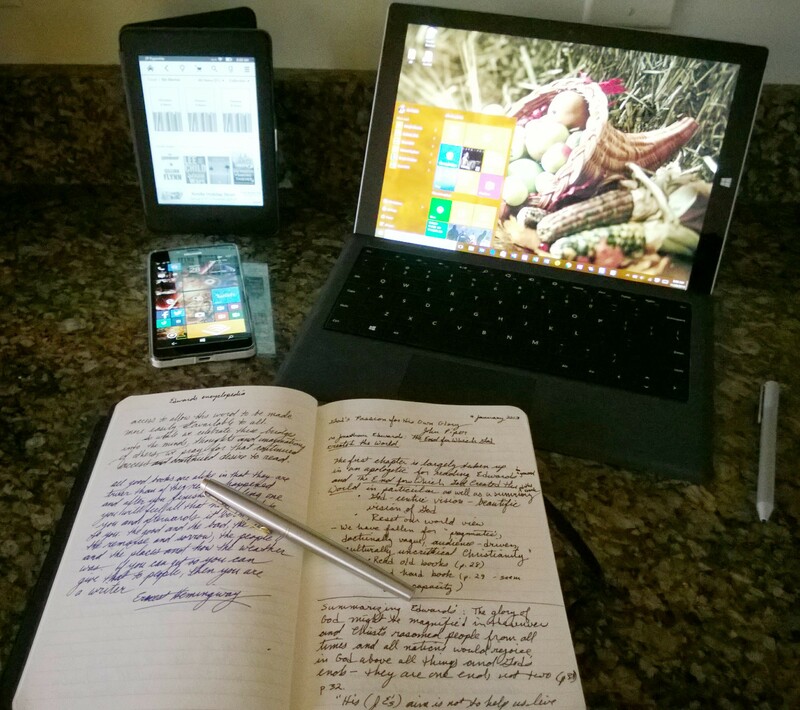 My current setup: A Kindle Paperwhite (version 3), Microsoft Surface Pro 3, Microsoft Lumia 950 and a Moleskine Large Ruled notebook for work use (some things don’t change) and Rhodia Webnotebook – Lined for personal use. The Surface RT had a 10 in. 1366 x 768 (for comparison, 720p is 1280 x 720) screen with 2 GB of RAM and 64 GB of storage (with a microSD slot for another 64 GB), using a Quad Core Tegra 3 Processor running a limited version of Windows. This is a capable machine for most documentation, web-browsing and email tasks. It was light, relatively inexpensive, came with Microsoft Office, had a long battery life and worked well. The Surface Pro 3 has 12 in, 2160 x 1400 (1080p is 1920 x 1080, 4K, AKA 2160p, is 3840 x 2160), 8 GB of RAM, 256 GB of storage (with a microSD slot for another 64GB), using a Core i5 processor running full Windows 10 Professional. Now, that’s a lot of numbers but it basically means you have a full desktop replacement computer that can fit on a Starbucks table getting it all done. The stylus comes in handy for sketching out ideas on OneNote and that gorgeous screen is lovely when you’re watching Sherlock Season 3 for the third time whilst waiting for The Abomnidable Bride episode. Often overlooked, but important in this day of cloud computing and streaming, it also adds 802.11 ac, MIMO which means better and quicker connectivity. Nokia Lumia 920 had a 4.5 in, 1280 x 768 screen with 1 GB of RAM with 32 GB of storage with a Qualcomm dual-core Snapdragon S4 running Windows Phone 8.1 with an 8.7 megapixle camera (one of the first with optical image stablization) weighing in at 185 g being 10.7 mm thick. This meant it was a very capabable phone with a supurb camera and terrific screen. All of the Audible books, music and video you could wish. Microsoft Lumia 950 has a 5.2 in, 2560 x 1440 screen with 3 GB of RAM with 32 GB of storage (with a microSD slot for another 64 GB which can go up to 200 GB), with a Qualcomm six-core Snapdragon 808 running Windows 10 (mobile) with a 20 megapixle camera (still with OIS) weighing in at 150 g being 8.2 mm thick. This means it’s an amazing phone with a stunning camera and utterly gorgeous screen. 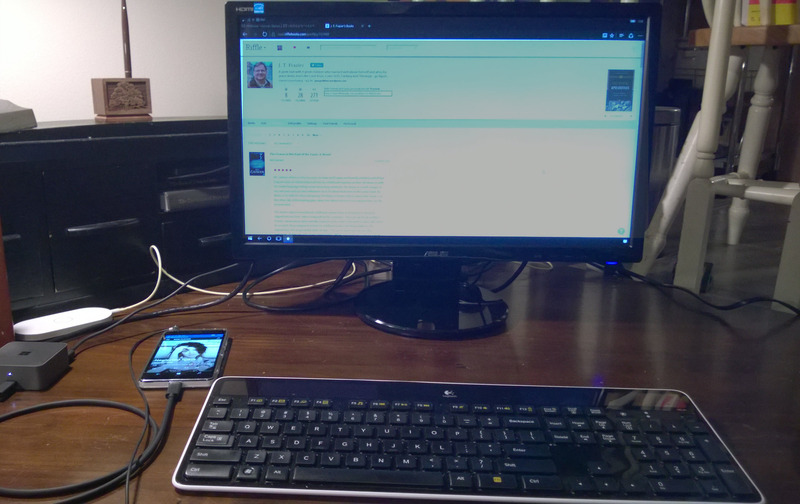 The user interface is similar to Windows 10 on the Surface Pro 3; with a display dock (and using Continuum), keyboard and monitor, it can become an office away from home. Kindle Paperwhite (v1) – a 6 in marvel which allows you to read anywhere, save highlights, take notes and save them to the cloud and sync with your Audible books. This version weighed 223 g, 9.1 mm thick and had a screen resolution of 768 x 1024 with a density of 212 ppi. (For more on the benefits of the Kindle e-reader, see here.) While it’s another device to carry, don’t use a notebook, tablet (even a Fire) or phone for reading, either use paper or an e-ink reader like the Paperwhite. Kindle Paperwhite (v3) – Very similar to the first version but with a super sharp 1440 x 1080, 300 ppi screen weighing 205 g, 9 mm thick. With font tuning and a sharp screen, the Paperwhite is a delight to use. (I once owned a Kindle Voyage which is slightly lighter and thinner than the Paperwhite with the same sharp screen, but it decided to keep traveling in an Uber car somewhere in Orlando). This is my primary tool for reading; I carry thousands of books wherever I go. Anything I can do in the office, I can do on the road. I can Skype into a conference call, share documents, research, read, review and design. That wasn’t quite true in 2012; I could do most of what I needed to do, but had some limitations due to a limited version of Windows. That limitation is gone. The other difference in 2015 is that it’s all easier, quick and works more smoothly. 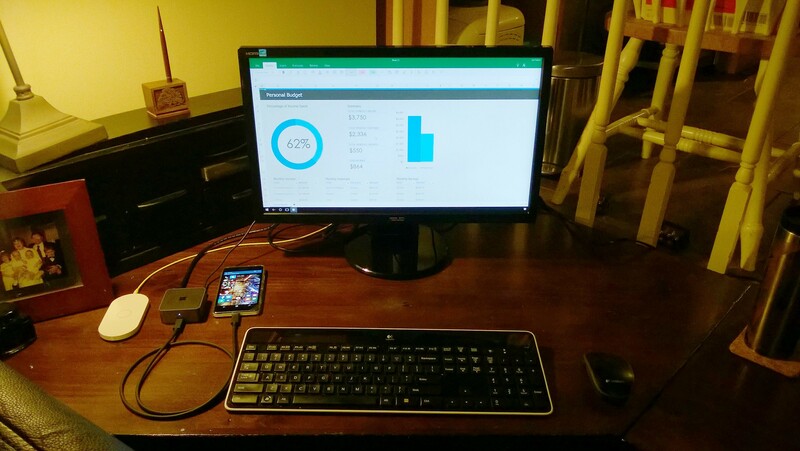 Moving from Surface to Lumia is straight-forward with a shared Windows 10 core, applications that work on both and the ability to pop into desktop mode on my phone makes finishing updates to documents dead easy. There never was a better time to be mobile, whether that’s working in your backyard, at a hotel or at Caribou. Power, precision and a lovely experience are all available on the road. The life of the road warrior has fundamentally benefited from the improvement and convergence of technology. They can take less with them and do more with what they have. The cell phone has probably enabled the lighter and more capable office than any other device. In one device, we have a digital music and video player, digital recorder, HD camcorder, gps, camera, mobile hotspot and phone as well as a place to do limited document creation and updates, email, reading and note taking (not to mention audiobook player – I love Audible). Combine this with something like Microsoft’s Surface and you have a quite small footprint to do a ton of work. Now, not everything is about convergence; nearly by definition there are compromises taken in multi-purpose devices. Price of more focused devices have come down considerably, for example, the least expensive Kindle can be had for $70 while their best Kindle, the Paperwhite, it still just $120. So, now you can take your library with you in an eminently readable format that’s easy on your eyes. Moreover, with the reduced sized, e-reader, smartphone and tablet with keyboard come to under 3 lbs. Throw in a notebook when you’re feeling old school, you’re still at less than 4 pounds. That’s what a regular business-class desktop notebook would weigh. 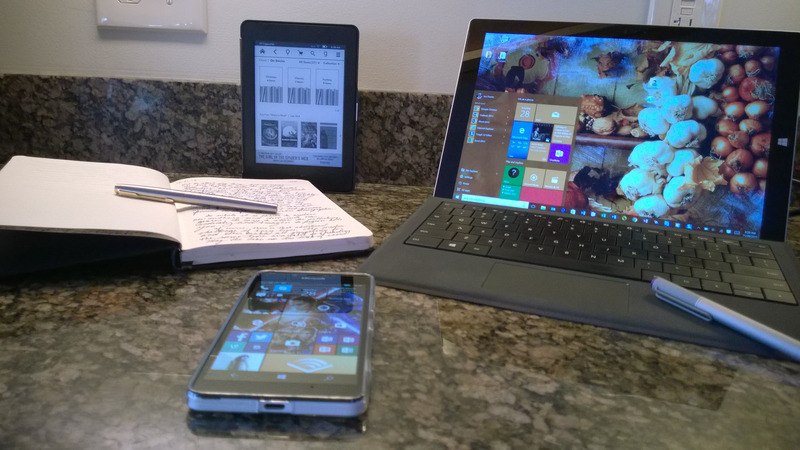 My particular poison is a Kindle Paperwhite, Microsoft Surface RT, Nokia Lumia 920 and Moleskine Large Ruled notebook. There is very little I can’t do with these tools. Whilst our dear friends, the road warriors benefit, so do those of us blessed with (mostly) staying home. This mobile office also works when I have a quick meeting at Starbucks, catch up on reading at the dentist office or hunker down in the bedroom when vociferous friends are watching movies with your kids downstairs. My visits to in-building conference rooms for meetings are now with the Surface and Moleskine notebook. So our micro-traveling in the daily course of our lives is improved and more productive, whether for work or personal goals. It even helps when trying to fit your work on those little café tables at Starbucks. The largest dimension of these items is under 11″. What you need to remember – you have lots of things to bring with you. Need to pick new shirt – where? #@%!, how do you get from the hotel to the conference center? talk -> email -> talk?